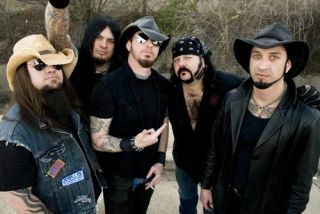 Vinnie Paul fanatics dig our your piggy banks because the cowboy from hell is about to bung a whole load more of his unwanted junk on eBay. Last week we told you that Vinnie was thinking about listing his toilet on the web, and he's just told the WRIF 101.1 radio station that he's got a couple more items up his sleeve. He said: "Let me tell you something... If you're anybody — not just me, but anybody — and you can put an oven that doesn't work at all on eBay and sign your name on it and sell it for $1,200 and somebody will drive from Seattle to Dallas, Texas to get it, that's pretty cool. "It's not about the money — it's not like I can't afford to buy my own coffin when it's time to go, you know, but it's about the 'nut' factor. "I've got something else I'm about to put on there, too. Well, I've got two things — I've got one barbecue grill I'm about to put on there, and it works just fine — but I've also got my 1993 Mitsubishi 3000 [car] I'm gonna put on there. Probably the 'Blue Book' [value] on it [is] $700, but I guarantee you I'm gonna get about $12,000 out of that thing." When asked what he does with the cash he rakes in from the auctions he added: "It just pays for me and Greg's [Tribbett, HellYeah] drinking habits."